I jumped right into this card on Saturday after getting the 'cheater' email about this week's destination. Not only did I know I had all the components to meet the requirements but because I felt deeply with the recipient. I don't ever want to be in her place. I've thought about the situation a lot over the past couple of years as I've addressed my own mortality, and those around me. Thinking of being without my best friend of 29 years sends me into a panic attack. Something else I seem to experience more as I get older. So this card is close to my heart and I hope it gives Teapotter Robin a bit of smile in what is a very dark time for her. A quick overview, Robin's husband died in February from shock after experiencing an explosion while mixing rocket fuels. You can read her entire story HERE. Aside from finding peace at the ocean, she loves her yellow mustang. She's had it for years and it's full of memories for her and her husband. We were asked to think beach and bonus goodies if we included a yellow mustang. Well, I didn't have a mustang - a clear stamp from Paper Crafts is all I had to work with but I made it bright yellow and parked it right on the sandy beach. I used the red tape for the beach, coating it in sand. 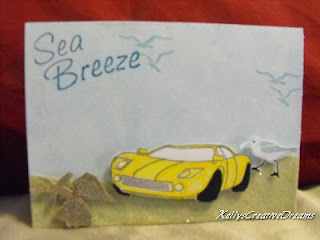 The shells, sentiment and gulls are all from a Sea Breeze clear stamp collection by InkaDinkaDo. The shells were stamped in Iridescent white on SU Soft Suede then triple embossed with Translucent EP. Sea Breeze is stamped in SU Pacific Point and the gulls in SU Baja Breeze. I colored the car with LePlume Lemon Yellow. My heart goes out to Robin at this difficult time and hope all the cards she will receive in the coming days let her know how much she is loved and thought of. Over the past two weeks I have been blessed with the Liebster Blog Award. The first one came from my SCS Quacker buddy, Shell. Shell is pretty awesome and I'm happy we're friends. The second one came from Terria. Terria is one of our Paper Blogger Unite members and uber creative! She is also an SCS member and where we met. I hope you'll take a few moments to check out both of these ladies' blogs. Thanks gals! The concept behind the Liebster Blog Award is to bring attention to blogs with less than 200 followers. So in the spirit of good fun, I am passing this award on to five other bloggers. Please stop by and encourage them by leaving a little love. I am awarding this to 5 very special people in my creative circle. Note, not all of them are artists. Some are writers and well deserving of this award for their amazing talent! Bob has gone back to Chicago, the house is quiet and I can get back to a working routine. Saturday night while he was at a Lodge meeting, I had four hours to live in the studio. I enjoyed some uninterrupted creative time while 70's music on the Direct TV/ Sirrus channel kept me company. I started by looking through past card swap kits I've received and decided to start with January of this year and work my way back... all the way to April of 2011. Yeah, it's been that long since I've been able to keep up with the kits. The card kit from January was all about tea and coffee. Yum! Talk about inspiration. Flipping through my magazines, I found a LO in the Oct. 2009 issue of Crafts n Things magazine just perfect for one of the items in the kit... 3 individual coffee/ tea cups. Ya'll know I'm not a big fan of non-traditional shaped/ sized cards but I seem to be doing more of them lately. Probably because the inspiration card calls to me. Do me! Do me! This particular card and LO was a 5"x5" card from Michele Boyer entitled Happy Anniversary. She used more vintage-toned DP and her images were 3 Dogwood flowers. Michele is a very talented paper artist. Aside from having her own blog, Paper Cuts, she has been featured in multiple publications and on-line company sites. I knew her name was familiar. Checking out her blog showed she is a Dirty Dozen alumni at SplitcoastStampers! If you really want to be inspired, check out Michele's GALLERY. The papers is from Martha Stewart, the cups from TeaCup Parade by Printworks and the sentiment in the corner is from a Studio G coffee set. I colored the cups with Derwent WC pencils, popped them up for dimension and placed them over a vintage trim. The mini brads (Recollections) on the sentiment echo the black knots on the trim. I hope you find inspiration and make time to play today! Today, I'm going to share some pics with you for a special baby album I put together last week. 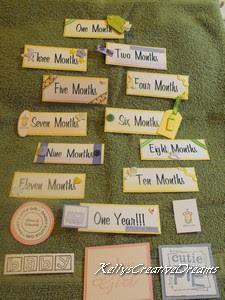 When I was first introduced to on-line baby showers, I thought they were the coolest thing. I still do. On-line showers, also known as Virtual showers, are great for when family and friends are spread across the country. They allow everyone to attend regardless of where they live. If you're not familiar with this party scene, they're easy and fun. As with any party, you need a hostess. In this case, someone who can be organized as it does take a bit more planning because once you've sent out invites and have an RSVP list, you'll want to send small party favors to the 'guests' ahead of time. 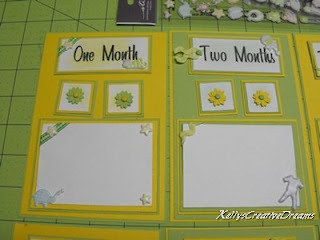 Plan a time to hold the shower and send out invites to everyone, along with a chat link if necessary, along with any links to baby (or bridal) registries. 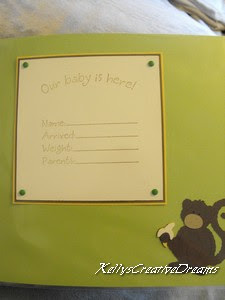 It's also good to include personal wish lists, colors/ themes and in the case of baby, if you know the gender. Everyone makes or purchases their gift and has it sent to the honored guest ahead of time. If it is a handmade gift, take a couple of pictures before you package it up. When purchasing on-line, have a link handy in your files. On the date/ time of the party everyone meets in the chat room. As the honoree opens a gift, she tells who it's from. While she's sending packaging and gift wrap flying, the person who sent the gift posts their pictures or a link to the purchased item so everyone in attendance can ooh and ahh right along with her. Because we didn't know the gender of either baby, I went with neutral tones for both of them. 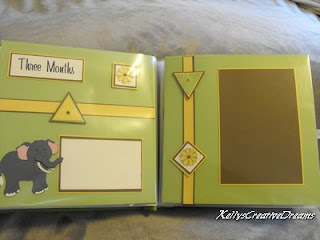 However, with Heather, we knew she had the Amazon Jungle kind of theme going so I borrowed the Animal Kingdom Cricut cartridge from Maggie so I could make some cute animals to accent the album pages. I LOVE this cartridge and had fun doing the layering/ paper piecing of the animals. I've made several extra animals to use in Abby and Adrian's albums before shipping the cartridge back to Maggie. 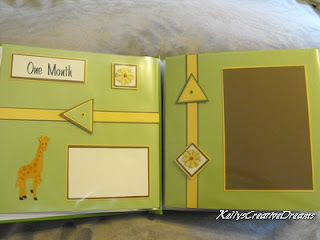 For Heather's album I used SU Certainly Celery, Daffodil Delight, Very Vanilla and Soft Suede cardstock along with varying other colors for the animal piecing. The components for this album are really versatile. I first got the idea early last year when I did a Page LO component swap hosted by the same gal who coordinated both of these showers. You can check out my original post HERE for the details. This week's TPT card has a destination but not to a specific person. We are sending to the children's ward at a hospital in Schenectady NY. You can read about why this hospital was chosen HERE. Being in the hospital is no fun but to be a child in the hospital on your birthday has to be the pits. This week we hope to change the mood. We were to include a variety of things... the more the merrier. Everyone should be a STAR on their birthday - regardless of where they celebrate it! I knew the SU Ice Cream Parlor DP was the perfect paper for both it's bright colors and pre-created color pallet. 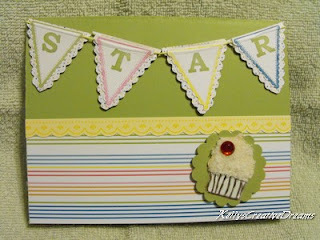 I chose the Pear Pizzazz from the stripe as my base and played with the other colors in the inks. lower soft, dimensional gel and bling. I centered it on a scalloped circle then popped it up. For the banner, I chose my Technique Tuesday 'Message in a Banner' set which I won on SCS last spring. Freebies to work with are always good! I stamped each of the four with a different ink color then matted them on another Ice Cream Parlor DP paper. The letters are stamped with SU Bold Alphabet (retired) in Pear Pizzazz. I strung each pennant from a piece of yellow twist paper and only put the pop dots on the top edge so the pointed end hangs free. The 'ribbon' strip is a sticker border from that same DP pack. 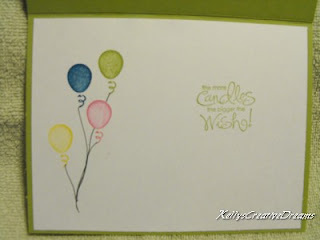 I carried the same ink colors over to the balloons on the inside (stamped with the balloon from SU mini messages -retired) and the sentiment from Whimsical Words. I hope my card brings a smile to some child's face on a day when they may not have a lot to smile about. Tomorrow... that baby album I promised you! This week I'm revisiting another artist - Elizabeth Allan. I didn't intend to, it just happened. I guess when you find someone who's style you like, you can't help but tune into them. I started with the image for this week from The OutLawz Freebie challenge. 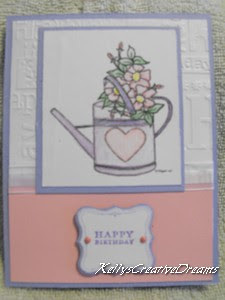 The watering can full of flowers seemed to lend itself to a birthday card. One of my nieces has a birthday next week an I thought this would be perfect for her. Elizabeth used a Teal base and a different CB folder for her background. Her image was on a circle, matted with light pink then again in a teal scalloped circle. She stamped the sentiment in the bottom third of the card. The watering can image didn't lend itself to a circle so I went with the clean lines, adding a bit of curve with the sentiment mat to mimic the curve in the heart on the watering can. Although you can't see it very well, I inked the CB folder with Pretty in Pink before embossing the white cs. That is a neat technique if you want a 'letter press' look to your embossed image. Simply stamp ink all over the inside of the folder - the 1/2 that will be the top of your image. Place your CS in the folder and emboss as normal. Carefully remove your embossed image and wipe the folder clean with a bit of stamp pad cleaner and paper towel or a baby wipe. Along with creating the card to cheer Katy up a bit we were to include camo in some form. Katy loves camo and the military. While flipping through my pink papers I found this watercolor heart paper and knew it was perfect. I used the Lacey Labels Cricut cart to cut the heart and layered it right on top of the same paper so it seems to blend into the background of the card. To keep it from being too plain I added a small ribbon strip of SU Pretty in Pink CS. 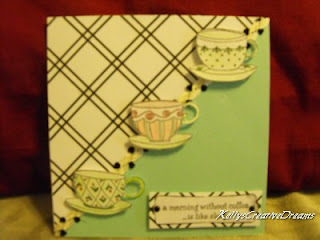 The sentiment is stamped with one of the stamps from Whimsical Words (SU) in Regal Rose. Even it seems to float into the background of the heart. Speaking of Valentines, I am spending a couple of days with hubby at a hotel just relaxing and am trying to be on-line as little as possible. So I'm taking the rest of the week off. Next week I'll have Magazine Monday, Teapot Tuesday and Wednesday I'll show you that baby album I told you about yesterday. I also bought a book on sketching faces today. Hopefully next Thursday I'll be able to show you a completed cover for my Whispers art journal. Okay, no one faint. I have Monday's and Tuesday's cards done! I'm getting the Monday post uploaded tonight as we are under a Winter Storm Advisory and could have ice in here tomorrow. With the ice, there's a good possibility I won't have internet. 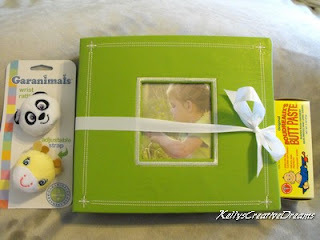 The past few weeks I've been working on a 8x8 album for a lady in Canada who will be having her first child any day. I needed a card to go with her gift and remembered I had a magazine with multiple layouts available. I chose a card made by Julie Ebersole titled 'She's Here!' showcased in the May 2005 issue of CardMaker magazine. (pg 46) I kept the layout the same with the exception of using what I had to work with. I used the same colors for the card I used for the album (which I'll show in a later post)... SU So Saffron, Soft Suede and Certainly Celery. 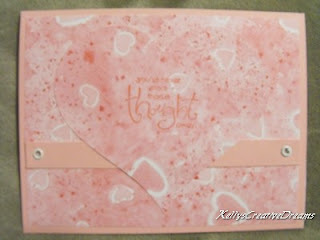 Julie used a velum tag with a pink doodlebug button and the sentiment said She's Here! I didn't have a velum tag but I did have a tag stamp from Hampton Arts. So I stamped and embossed the tag with silver on white card stock. I also didn't have a ribbon I liked so I replaced it with paper twin in the three coordinating colors. I don't know which SU set the onsie stamp is from. I've been back through SU catalogs to 2000 and could not find it. I picked it up at a garage sale by itself about five years ago. The sentiment, 'Little One' is from the Nice n Narrow set. Hubby and I are taking off for Valentine's Day on Tuesday morning. I hope to get the blog post uploaded before we leave. It's a Camo Valentine! Cute and simple! Another beautiful day in the Ozarks. It is hard to believe we are still in the throes of winter. It is 54 degrees outside but if you are in the sun, it feels much warmer. I even ventured outside to photograph today's card. Today's inspiration comes from the February 2010 issue of Crafts n Things Magazine. 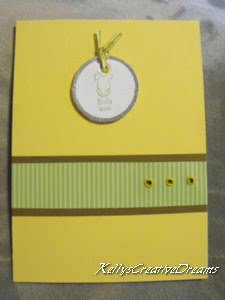 The card I chose was 'Love is the Reward' by Crafts n Things Design Team member, Elizabeth Allan. Her cards are beautiful and I encourage you to stop by her blog for a peek and say hello. She used a 4.25x5.5 vertical card. Her card title echoes the sentiment she stamped on white CS, matted and tied with the striped ribbon at it' base. She used 3 square brass brads positioned on-point to the left of the sentiment. Her card has a distinct vintage feel that caught my attention. I was inspired by the color scheme and the simplicity of the sentiment. And I think my choice of DP is just feminine enough to cover my tastes without being too girly for my husband's valentine. What do you think? For my husband's Valentine, I chose to flip Elizabeth's design horizontal to coordinate with the layout of the sentiment from SU Holiday Best. I ran the ribbon beneath the sentiment rather than tie it. I used SU Cherry Cobbler and Chocolate Chip CS and a print from My Minds Eye called Love of My Life Floral. I followed Elizabeth's design of giving the brown mat for the sentiment a scalloped edge to soften the look, again just soft enough for a girl but man enough for my 6'4" hubby. To balance everything out, I used three gold brads in the opposite corner. and share with someone you Love!